Melt half the butter in a large saucepan until foamy. Add the onion and garlic and cook over a medium heat for 3 minutes, until softened. Tip in the rice and stir to coat in the butter, then add a ladleful of hot stock. Simmer, stirring occasionally, until all the liquid has been absorbed. Continue adding the stock in this way until you have about two ladlefuls left. Meanwhile, remove any tough stems from the cavolo nero and discard. Shred the leaves and add to the risotto with the remaining stock. Simmer until all the stock has been absorbed and the rice and cabbage are just tender. Stir in the pine nuts, basil, remaining butter and cheese, if using. Season to taste and serve straightaway. 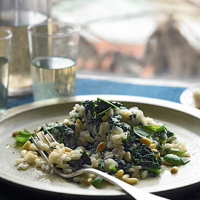 If you can’t find any cavolo nero, spring greens work just as well in this recipe.